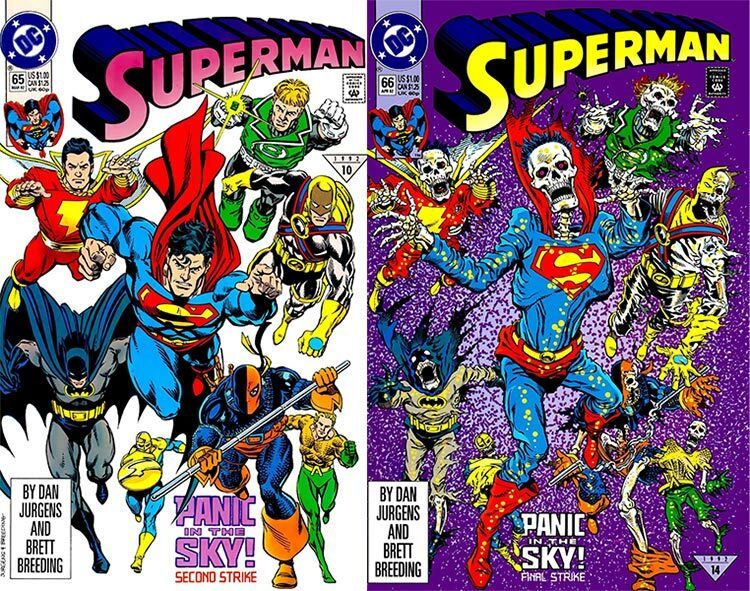 Superman #66 was released on February 18, 1992. It's a big issue featuring the conclusion of the battle between Earth's heroes and Brainiac's Warworld. The whole story was called "Panic in the Sky!" and has been reprinted in a collection by the same name twice. The "Panic in the Sky" event is notable for several reasons, the biggest being that it filled a bit of a gap in Justice League history. At the time, the league was on something of a hiatus following the "Breakdowns" storyline. It would be rebooted the following month with an infusion of more members from the classic roster in Justice League Spectacular #1 (also written by Dan Jurgens), but in the meantime, it was up to Superman to gather the heroes when Brainiac threatened the earth. Booster plays a small role in the ensemble cast. In this issue he has not a single line of dialogue. He doesn't even make it onto Dan Jurgens' paired covers for this and the previous issue. But that's not to say that Booster plays no role. Teamwork and trust are at the heart of this event, and Booster Gold has always made an effective team player thanks to his impenetrable force field and desire to earn the respect of his peers. This event introduces him to Maxima, his future Extreme Justice teammate, and Infinity Man, a criminally underused member of Jack Kirby's Fourth World. Count on Booster Gold to use Earth's impending destruction to build his social network. "Panic in the Sky!" isn't groundbreaking. In many ways, it is the very definition of a mainstream American super hero comic. That's not always a bad thing. If Booster Gold gave two news interviews and then gave five more, how many interviews has he given in all? If you had eight dollars and then spent four dollars on Booster Gold comics, how many dollars do you have left?